You can set line breaks individually for each score set, and also for each extracted part. Line breaks are saved with the project. By default, Logic Pro creates automatic line breaks based on the Spacing and Maximum Bars/Line settings in the Global Score project settings. You can override automatic line breaks using the Layout tool in Page view, and can also create line breaks by adding a Line Break symbol from the Part box in any view. For example, if the Global Score project setting for Maximum Bars/Line is 6, you can move additional bars into a line using the Layout tool. Any unedited lines will still contain no more than six bars. The full number of bars is only displayed if the spacing settings are low enough to allow the proper display of that many bars. For information about the Global project settings, see Global Score settings. For information about adding line break symbols, see Add page and line break symbols. 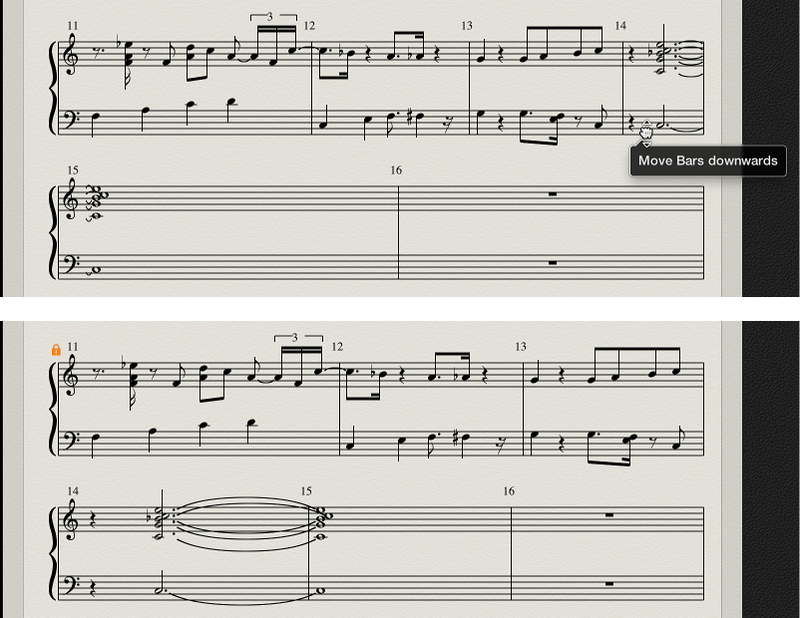 Note: If you drag more bars into a line than would be displayed using the automatic line break function, overlapping notes and symbols may result. In Page view, grab the bar (or bars) with the Layout tool and drag it down (the pointer changes to a hand with a downward-pointing thumb), then release the mouse button. The bar is moved to the next staff system, and the remaining bars in the line are distributed evenly over the entire width of the page. You can also move the first bars of a staff upward into the preceding staff, by dragging them up with the Layout tool. Choose a setting from the shortcut menu to add or delete a line break, or return to the default line break. When you move a bar with the Layout tool, all manually edited line breaks in subsequent lines are deleted, and automatic line breaks are recalculated from that line downward. If you want to avoid having later lines recalculated, hold down Option while moving the bars with the Layout tool. This limits the line break to the staff systems you are editing; other staff systems are unchanged.